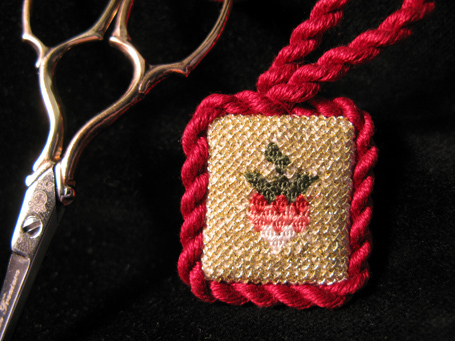 Instructions for this Needlework Nibble are available in the Web Projects section of the website. 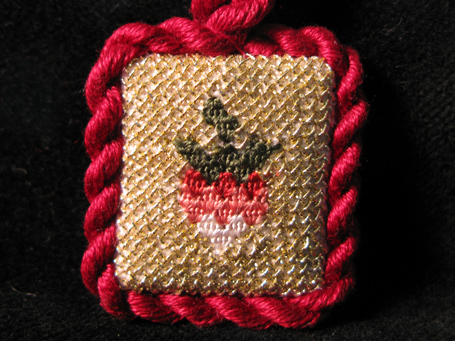 This project is based on a spot sampler in my collection, he strawberry repeats across the sampler corner. Examples of cushions worked in silver or silver gilt gobelin backgrounds usually have small queen stitch motifs arraigned in patterns such as that seen on my sampler. I have taken one motif and stitched it with Soie Paris silk and surrounded it with Gilt Special Tambour stitched in Gobelin. I had Gilt Special Tambour, a real English Wyre thread, manufactured for this purpose by Benton and Johnson. It is thick enough to cover the ground as seen in historic examples but also is a balanced thread that will not twist up on you when stitching as easily as other metallics. 34 ct. Legacy Linen, red silk backing fabric, Anchor floss for twisted cord, four colors of Soie Paris, Gilt Special Tambour thread, and a needle. Instructions for this project are available in the Web Projects section.